One of the reasons we love living in Bordeaux so much is our proximity to some of our favorite things: many of the best wines in the world, nature and what we think are among the most beautiful beaches in Europe. Perhaps you didn’t even know that this world famous wine region is a mere 30 miles from the Atlantic Ocean or that we’re home to Europe’s largest sand dune. While Bordeaux elicits images of the finest wines produced in castle-like châteaux, this area of the Southwest of France also produces a slice of the 150,000 tonnes of oysters produced in France each year. And we recently discovered how you can combine both land and sea on a Bordeaux private day tour of the Arcachon Bassin and the Margaux vineyards. Bordeaux has so much to offer beyond wine, though the world class wines are often what attracts visitors to this corner of the Southwest of France in the first place. 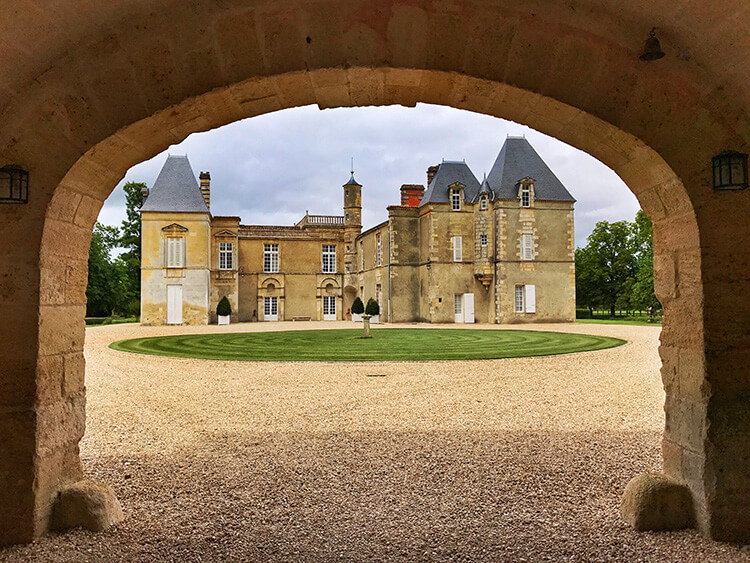 It’s with almost tunnel vision that visitors arrive and make a beeline for the most famous and prestigious châteaux. Names like Château Margaux, Château Lafite Rotschild and Château Latour are recognizable to almost anyone. But Bordeaux is home to so much more worth discovering on your trip. From the 347 listed buildings in the UNESCO city center of the city to the hundreds of kilometers of bike trails leading through the largest pine forest in Europe and straight to the sea, we’ve lived here over a year now and have still not even scratched the surface. It’s impossible for visitors to see all of the best of Bordeaux in only a few days, but Unique Tours Factory does an excellent job of combining some of our favorite parts of Bordeaux. Our private guide, Frédéric, picked us up bright and early for our full day tour right in front of our city center apartment. While it was just the two of us for this private day tour, the tour can accommodate up to 7 people which makes it perfect if you’re visiting with your family or a small group of friends. He had bottles of water for us, which would definitely come in handy as Bordeaux rolled in to yet another heat wave that day. As we drove on the surprisingly quiet streets, considering it was the day before Bastille Day when the French typically make a mass exodus to holiday at the beach for the long weekend, Frédéric told us a bit about himself. He is a born and bred Bordelaise, who’s family was once a château owning family themselves. He grew up learning the family trade of winemaking, went on to study wine and eventually discovered his passion is in helping people discover wine. He does that as a private guide on tours dedicated to Bordeaux and the most important industry here: wine. I knew we were in good hands and would definitely be learning a few new things about Bordeaux and its surroundings. The Aracahon Bassin is a like a giant wine glass. Well, we like to think so, though technically it’s shaped like a triangle and looks more like a martini glass from the air. Fittingly, the bowl of the wine glass forms a large bay that can change its’ area from 150 km² at high tide to just 40 km² at low tide. The stem of the glass is a 3 kilometer long narrow channel that exits out to the Atlantic Ocean passing in front of Europe’s largest sand dune, Dune du Pilat. We spend a lot of time at Dune du Pilat, but we hadn’t been on the peninsula side of the Bassin since we visited it on an excursion with Viking River cruises. 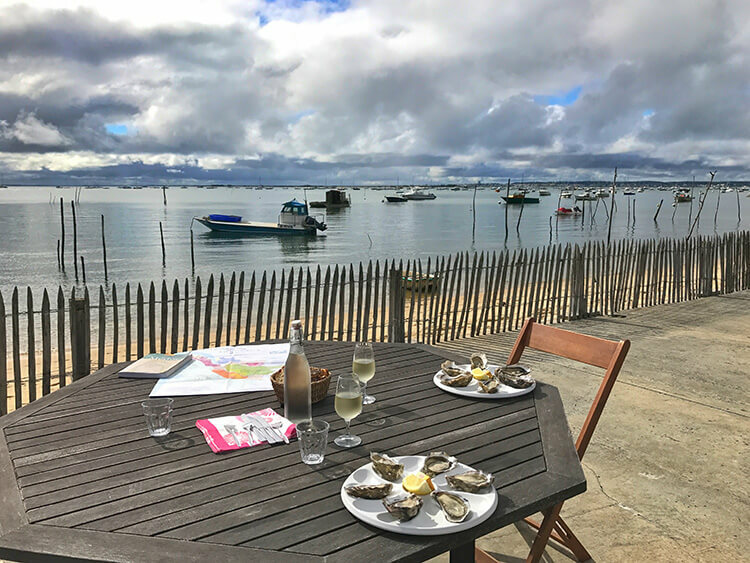 So it was great that our first stop was to one of the many oyster villages that dot Lège Cap Ferret, the commune that stretches the length of the Cap Ferret peninsula. 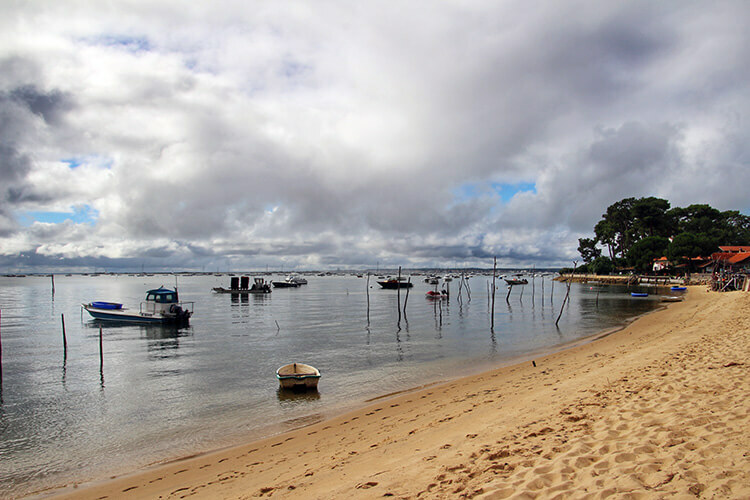 Long ago in Roman times, oysters grew wild here in what is today the Arcachon Bassin. As Frédéric demonstrated with different maps from throughout the centuries, this land changed a lot. Today, the oysters are farmed with some 700 acres of the Bassin dedicated to oyster farms where terracotta tiles are placed for the wild floating oyster larvae to latch on to and begin to grow. All Arcachon oysters start off wild, find and cling to the terracotta tiles and, when big enough, are scraped off by the farmers and placed in to a sort of mesh type bed. The beds are taken out deep in to Bassin and stacked in racks, where they’re left to then grow for at least two years. It’s no less than three years from when they were tiny larvae looking for something to latch on to that they can finally be sold and eaten. The vast tidal variations of the Bassin mean that they have a longer growing time then their counterparts, such as in Brittany, where they are submerged and can eat their diet of plant plankton continuously. This practice has been used since 1904, when oysters became an industry in Arcachon. There are around 350 oyster farmers in the Arcachon Bassin and they produce 8000 – 10,000 tonnes of Pacific cupped oysters per year. The production is small, really, considering that Brittany produces 35,000 tonnes of France’s annual 150,000 tonnes of oysters. 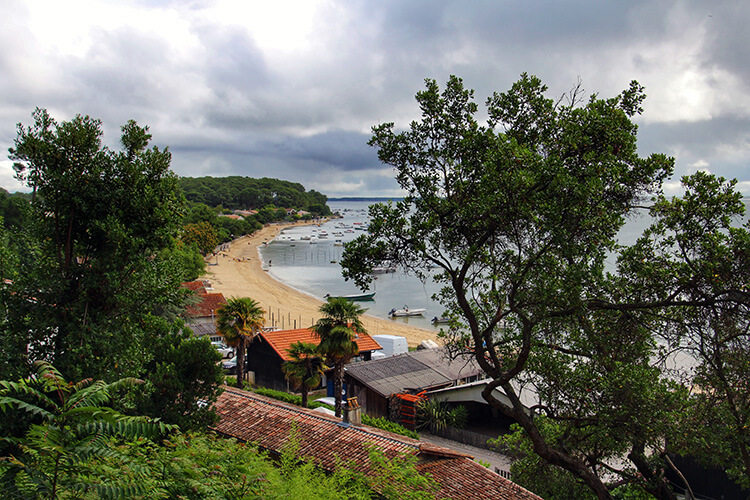 This is because the Arcachon Bassin is an enclosed bay and is limited in the number of producers it can support. They are all small scale producers and the Arcachon oysters are rarely sold in grocery stores. Even more interesting, 60% of the oysters eaten in France come from Arcachon. We’re certainly biased since we call Bordeaux home, but it seems from that statistic that the French agree with us that the best oysters come from Arcachon. What’s most charming about Cap Ferret is that most of the villages here are still very much traditional. Merely more than what many of us would consider shacks, the small wooden houses lining the Bassin are where the oyster farmers live and work. Oyster farming has only been an industry here since the 19th century and it’s easy enough to find the original style of wooden houses. Sandy paths wind their way through the villages and a stroll along them will get the better of your curiosity, as you can’t help but sneak a peek inside the open doors as you pass by. One day not all that long ago as the local oyster farms watched the Bordelaise flock to the Bassin for their annual summer holiday, a clever oyster farmer got the idea to set up some tables and chairs, put up a sign and sell fresh oysters with a glass of white Bordeaux to passersby. Not licensed to sell anything more than plates of freshly shucked oysters, wine and sometimes shrimp and bulots, there are now a handful of these charming oyster farms open like small restaurants. They typically have a handful of tables where guests can put their feet in the sand while slurping up oysters by the dozen with a bit of rye bread, butter, a squeeze of lemon and a glass (or bottle) of wine. Frédéric actually led us to a farm that doesn’t operate as a oyster hut, though. Selling oysters direct, farmers Christophe and Geraldine shared their passion with us and explained a bit about the different types of oysters. Where the farm is in the Bassin can make a difference in their meatiness and what they eat gives them different flavor profiles. We had a dozen total, with six each of the speciale and delice varieties. And we could tell the difference in the flavors, though we could never pick out tasting notes like we can with wine. Perhaps we just haven’t eaten enough oysters yet! 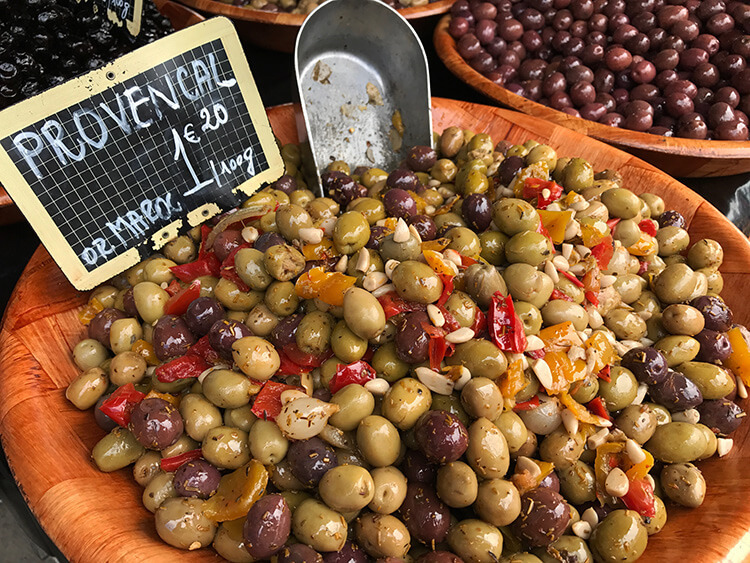 We have to note that a visit to the Marché de Piraillan isn’t usually part of this tour, but anticipating some holiday traffic that blessedly wasn’t, we arrived a little earlier than expected in Cap Ferret. Frédéric suggested we have a quick look around the covered Marché de Piraillan, which happens daily in summer from 8:30am – 2pm. 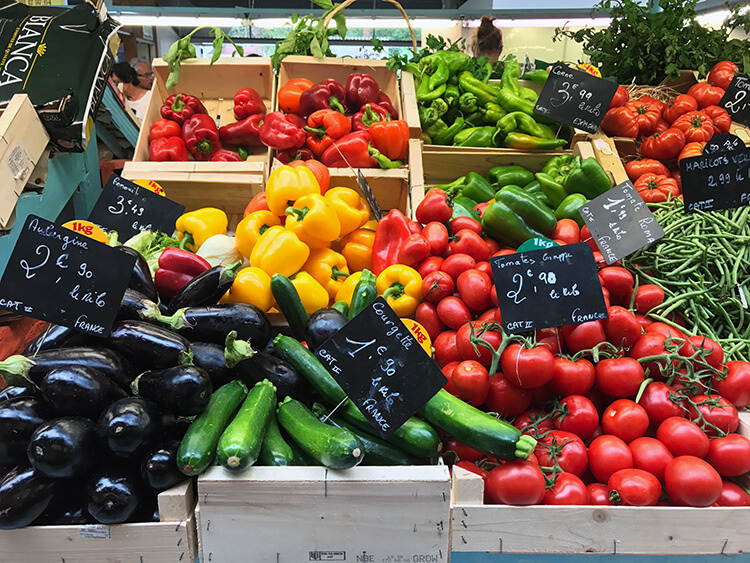 A visit to our own covered market, Marché des Capucins, is a regular part of our weekly routine in Bordeaux and we were curious to have a look at another. Outside the market hall, vendors sell everything from mattresses to the woven market bags. 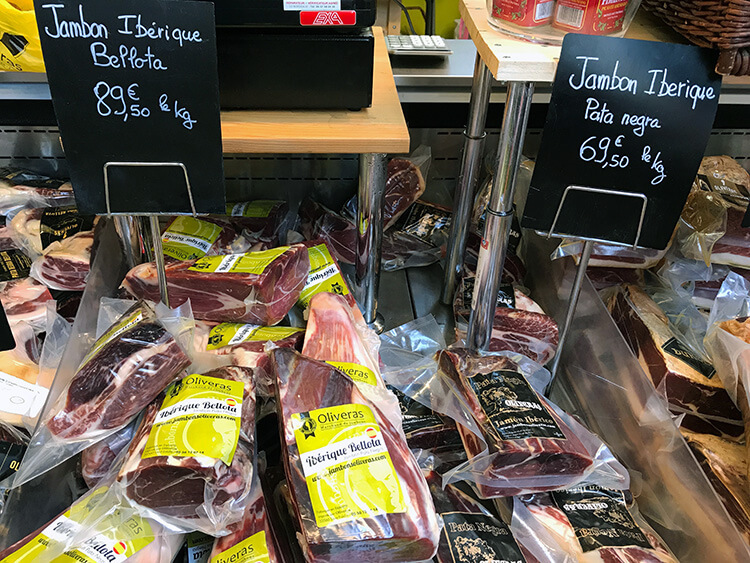 Inside, you’ll find rows and rows of all the delicious things from the Nouvelle Aquitaine region. It was all there: fresh seafood like langoustine and crab claws, seasonal produce like zucchini and melons, various jamon Iberico (ask for a taste! 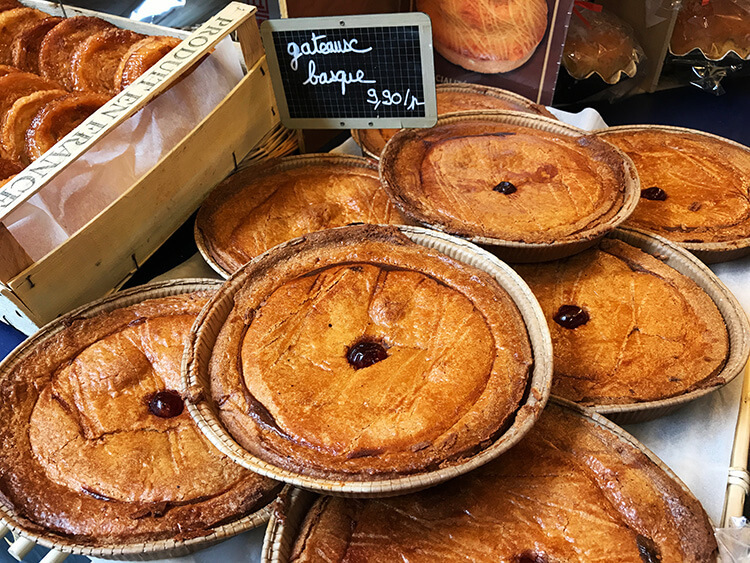 ), cheese producers and pastry makers with their delicious buttery desserts like kouign amann and cherry-filled gâteau basque. If it hadn’t still been before lunch, we’d have been tempted to fill a market bag with marinated mushrooms, seafood and pastries to bring home. 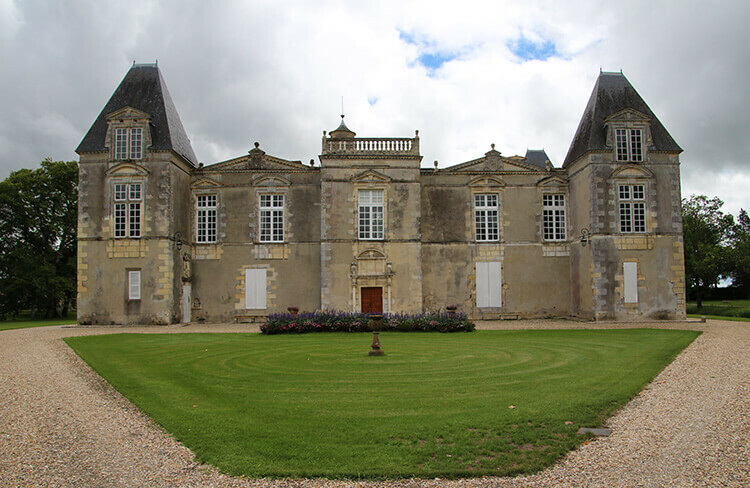 Often described as one of the most romantic châteaux of the Médoc, Château d’Issan had its claim to fame long before the 1855 Médoc Classification when it was listed as a third growth estate. Also one of the oldest châteaux in Bordeaux, it’s surrounded by a moat. It’s truly one of Bordeaux’s châteaux that just tastes your breath away. Bordeaux and England have a storied past. Though the history of Bordeaux wine dates back more than 2000 years to the Roman times, it was the Middle Ages that put Bordeaux on the map and led it in to the Wine Capital of the World that it is today. It really all began with Eleanor of Aquitaine. When she was Duchess of Aquitaine, she was the most eligible bride in Europe. Soon after her father’s death, she married King Louis VII of France and became Queen of France. Almost immediately, she sought to have her married annulled but the Pope denied her. After 15 years of marriage and Eleanor’s inability to produce a son heir, King Louis VII agreed to dissolve the marriage. She forfeited the custody of her daughters to King Louis VII in the annulment of the marriage, but her lands were restored to her. A mere two months later, Eleanor of Aquitaine married Henri Plantagenet, the future King of England. The wines of Château d’Issan are reputed to have been served at that wedding on May 18, 1152. At the time of the wedding of Eleanor of Aquitaine, the château wasn’t yet known as Château d’Issan; it was a fiefdom called La Mothe-Cantenac. In the late 1400s it became Théobon Manor, named after a female heir who married a lord by the same name. It wasn’t until 1575, after centuries of being passed down through a number of families, that the d’Essenault family acquired the château and gave it the present day name of Château d’Issan. The château was rebuilt and redesigned during that time. It sadly, like so many châteaux did during the wars, fell in to a state of disrepair and neglect. The Cruse family, who still owns 50% of the château today, purchased it just after WWII concluded in 1945. 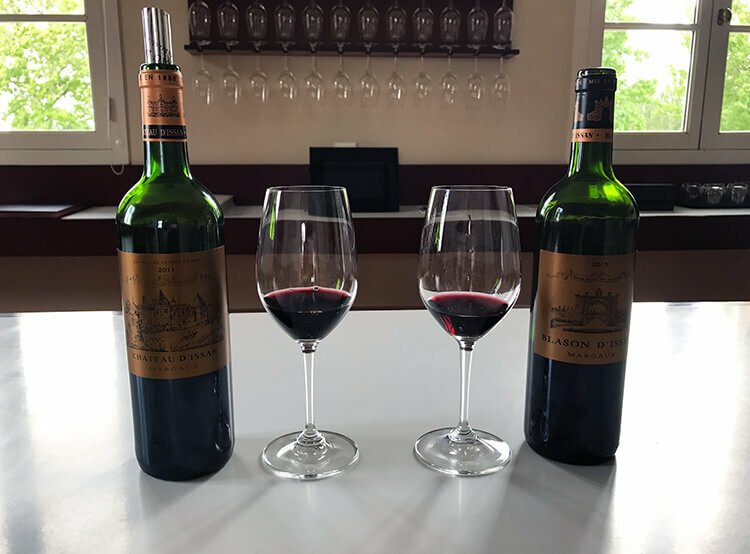 Lionel Cruse restored the château, replanted the vineyards and made significant investments to restore it to the glory days of producing the finest Bordeaux wines worthy of being served at royal weddings. The Cruse family still lives in the château today and while open for visits, they like to welcome just a select few and keep things relatively quiet. 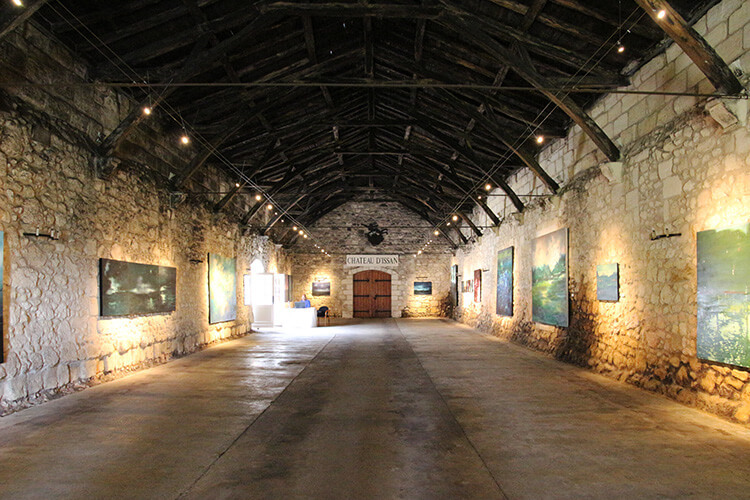 The best time to visit is each summer when Château d’Issan welcomes an artist for a solo exhibition in their cellar. As with all château visits, our began with a tour over the moat and on to the grounds of the château. Since it is still a family home, you won’t get a peek inside like at some that have been converted to boutique hotels or as event space. We did wander the grounds as we learned the story of the château. 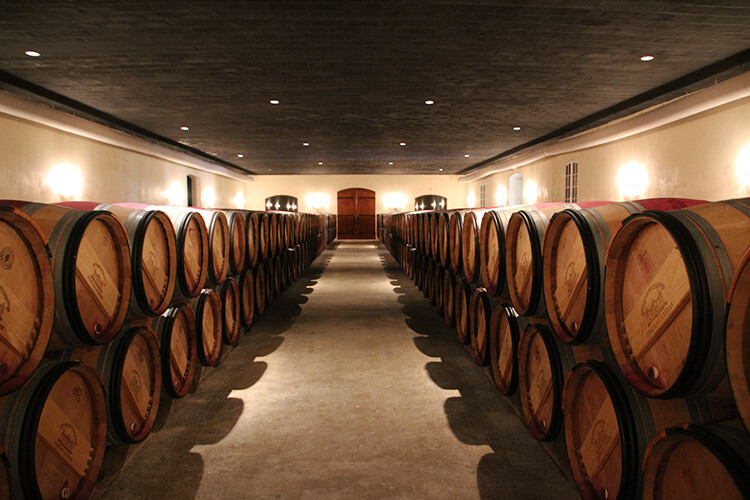 Each summer Château d’Issan has a solo exhibition in their cellar when it’s typically too hot for the barrels to be in this space. 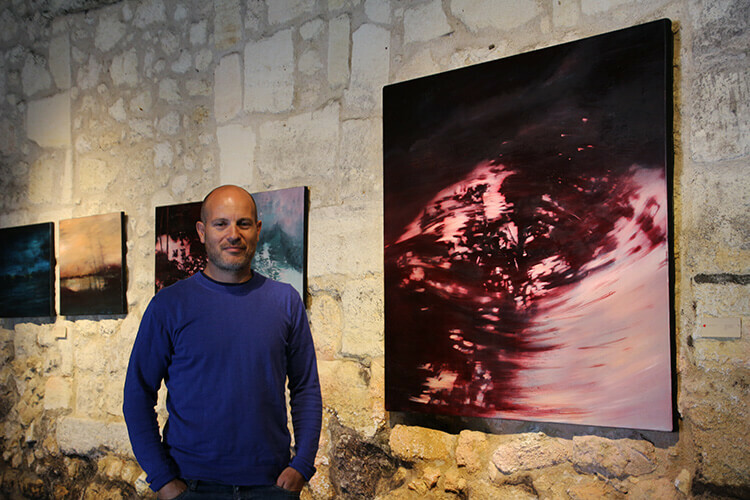 We were lucky that the artist himself, Guillaume Toumanian, happened to be there and he kindly spoke with us about his works. There’s just something inherently different when the artist himself describes the work, versus standing in a museum and wondering what he or she was thinking and wanting to convey. 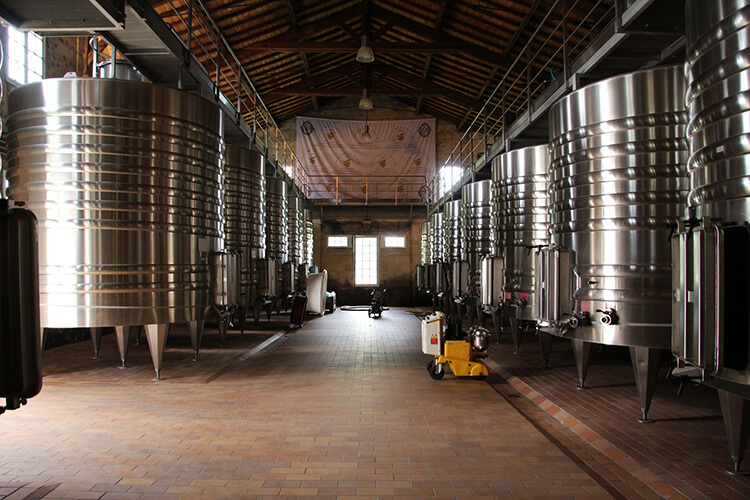 After admiring all of the exhibition, the tour continued with the wine making process in the cellars where temperature controlled stainless steel vats are used for the fermentation, before moving in to the barrel room. It’s always one of our favorite areas of a châteaux to visit since the scents of wine wafting from the barrels as it ages heightens the anticipation of finally trying the wine. The wine is aged on average for 18 months in the French oak barrels before bottling. Of course, this is all leading up to the climax of finally tasting the wines. Château d’Issan produces two wines: their 1855 Grand Cru Classé and Blason d’Issan. The Blason d’Issan is what’s known as a château’s second wine, a wine produced from the grapes that don’t quite make the quality cut to produce a Grand Cru Classé. Second wines are much less expensive than a Grand Cru Classé, but no less care or passion is put in to producing the second wine. They’re often an excellent way to enjoy a quality wine from top producers at more affordable prices. We tried the 2011 Château d’Issan 1855 Grand Cru Classé, which is still a bit on the young side to be drinking for a Margaux wine. It’s a blend of 64% Cabernet Sauvignon and 36% Merlot and is lush and full bodied. While still very young, the 2015 Blason d’Issan comes from one Bordeaux’s most recent and best vintages. A blend of 65% Cabernet Sauvignon and 35% Merlot, it’s already drinking polished and refined. There’s a small shop and the opportunity to purchase some of the wines direct from the château. The Bordeaux private day tour of the Arcachon Bassin and the Margaux vineyards is €574 for two people and €33 per additional person up to 7 guests. Children under 12 are free. You will visit an 1855 Classified château, but not necessarily Château d’Issan. Other possibilities are Château Rauzan Segla, Château Lascombes or Château Palmer. There is a lunch stop at a gourmet restaurant in Margaux, though lunch is not included in the price of the tour. 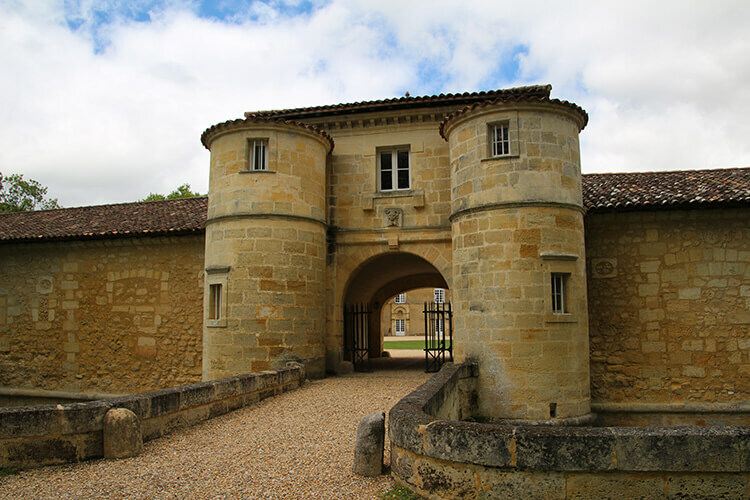 Other private day tour options offered with the same guide, Frédéric, are a day tour to Saint-Émilion with a guided visit of the Medieval town and three wine tastings at châteaux or a half-day tour of Graves on which you visit two historic châteaux for tastings. Our tour was provided by Unique Tours Factory in order to bring you this story. However, Luxe Adventure Traveler maintains full editorial control of the content published on this site. As always, all thoughts, opinions, and enthusiasm for travel are entirely our own. This article contains affiliate links. When you book your Unique Tours Factory tour through our affiliate site, we earn a small commission at no additional cost to you. Fantastic — everything a person could want: wine, food, art, beauty, culture …. I’d say this is a wow. Thanks for sharing with us. Love it! It’s a really great tour to see two totally different sides of Bordeaux, especially if you are just visiting for a few days. The only problem is you’ll want to stay at Cap Ferret longer and visit even more of the impressive châteaux! The tour was a well spent day. Our guide was quite interesting and we learned a lot about the region. Even though I don’t eat oysters the tour was fascinating to see how the farmers made their living. The chautau was beautiful and the wine excellent. I would recommend this was a great way to spend a hot day. Glad to hear you enjoyed the tour! What fun. My favourite kind of trip to France – with lots of food and wine. Can’t beat a good Bordeaux either! This is exactly our kind of day, I would love the oyster and wine tasting. Lucky you guys got to do this. I heard that the wine there is really good. Wow. What a great and thorough post. I actually was completely ignorant about this region until, ironically, just a few hours ago when I met a friend who went to school there. Now I have a lot more understanding about what it\’s all about, and I\’m definitely interested in visiting myself someday. France is one country in Europe I\’ve hardly scratched the surface of. I\’ll have to see when I can squeeze it into the schedule. I’m not a wine connoisseur, but I know that French wines are the best. I’ve been to some wine tastings in Spain (never been to France), but this seems to be an experience in itself! Would definitely take that tour when I have a chance to visit France. Oysters, wine and beaches that is definitely our kind of place. 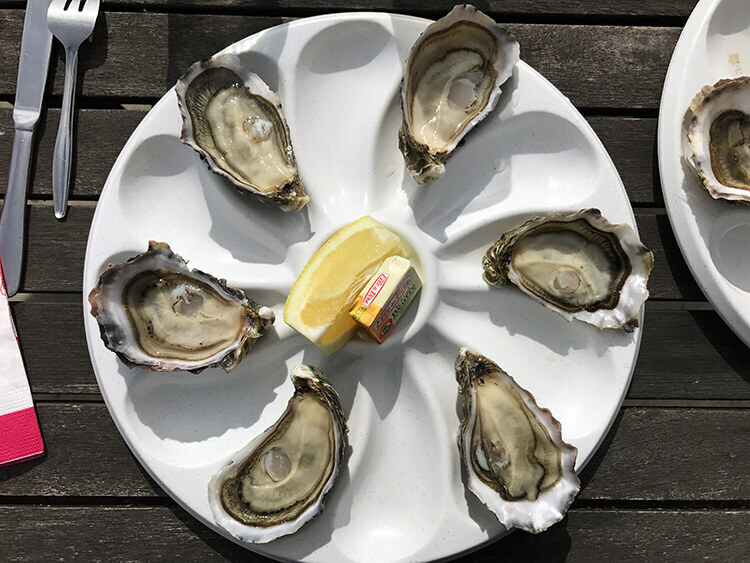 Interesting to try the different varieties of oysters together for comparison, we generally get one region in season at a time so although we have different types at different times of year I haven’t compared like that, and would love to try it. What a fantastic tour. Of course, I’ve heard wonders about Bordeaux wine region and the city itself but I did not know anything about the oysters industry.. For those who love wine and oysters this must be a paradise . . .
A day with wine and oysters – perfect! It looks like a really great tour!!! 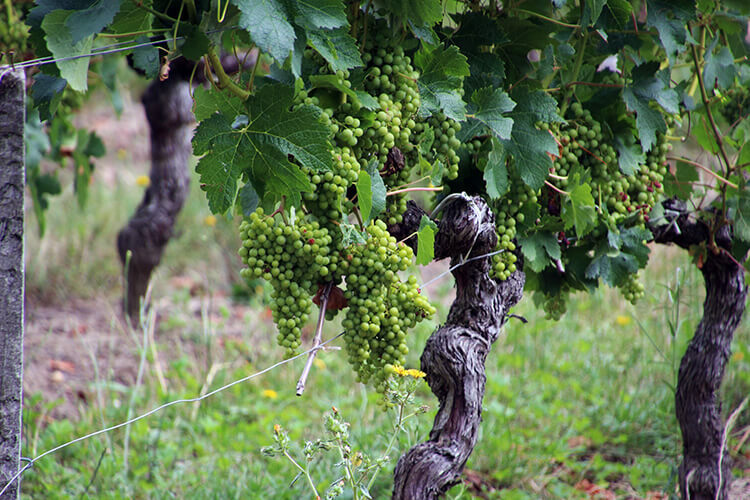 Great guide – I have wanted to go to Bordeaux for many years ever since I was studying French in high school – although as an adult I’m more intrigued in the wines and oysters! Great tour.